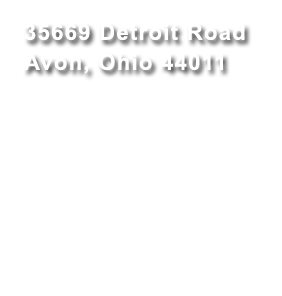 John, his grandson, took over the operation in the 1960’s and, in 1997, John’s son Jay built a 6,000 square foot market to serve the growing population of Avon. The Pickering family still runs the business today. The Grafton Township (Belden) farm sits 20 miles south of the Avon farm and is where Lill and Jay live. 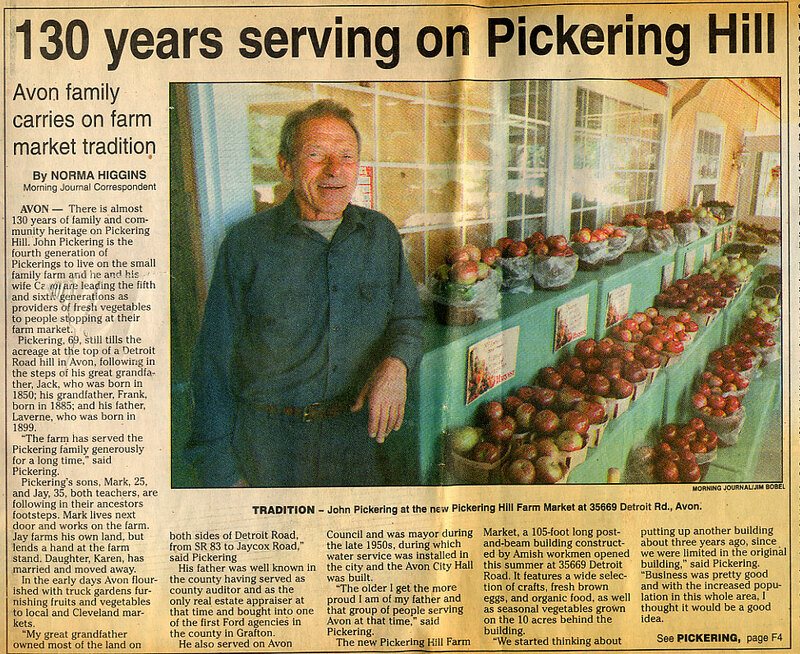 Lill and Jay purchased this farm in 1992 to provide Pickering Hill Farms with enough land to continue farming as houses replaced some of the rented farmland in Avon. 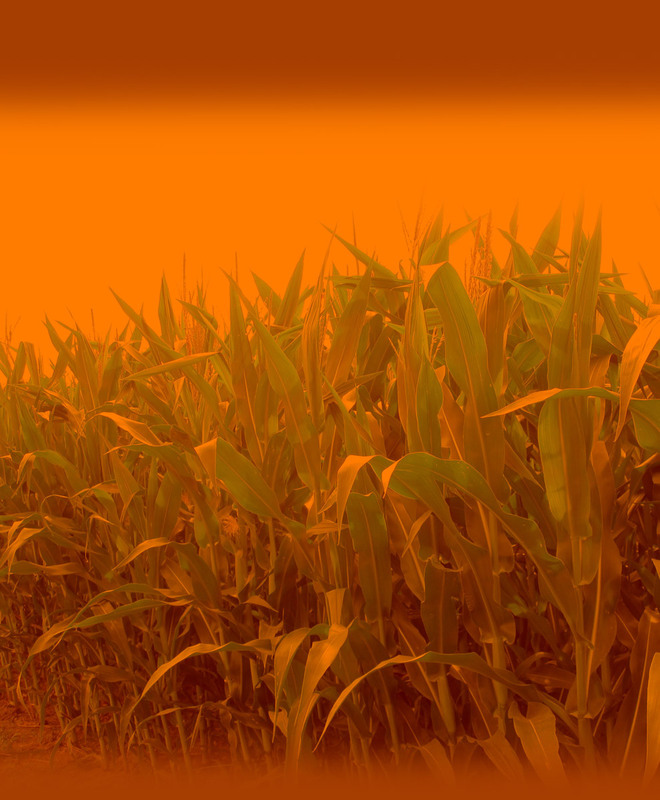 Here we grow our mid and late season sweet corn and most of our pumpkins on 50 acres. Much of our soil here was deposited by the nearby east branch of the Black River giving it a unique gravely texture which is well suited for holding moisture during the dry months of late summer. During sweet corn season Jay, their kids and dog Maple start every day by picking the day’s sweet corn then bringing is to the market in Avon. As mentioned previously Lill and Jay live on the Grafton Farm with their four children and dog Maple. Their children: Ethan, Jason Rachel and Tessa all help on the farm. 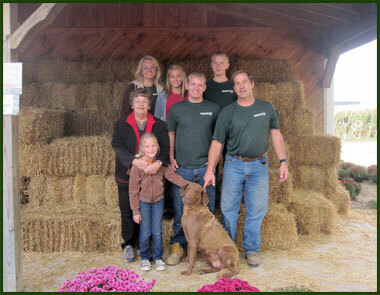 Jay runs the farm and is a Chemistry and Physics teacher at Lorain High School. He has a B.A. from The College of Wooster and Masters Degree from Bowling Green State University. 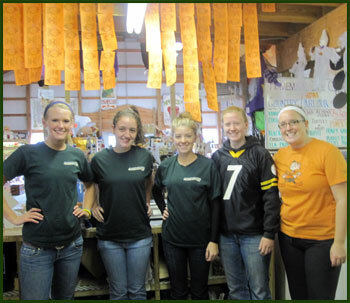 Lill runs the market and has a Bachelor’s degree in Business Administration from Cleveland State University. Karel, Jay’s mother, still helps although she describes her role as semi-retired. Karel keeps herself very busy delivering meals on wheels to local elderly people, visiting people in the local nursing homes and keeping very active in the Avon United Methodist Church. I would be remiss in creating this “about us page” if I did not tell you about my father John. 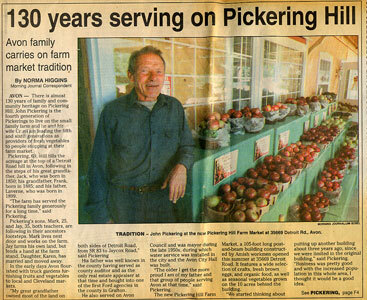 He was the original face behind the current Pickering Hill Farms. He grew up helping his grandfather Frank on the farm and grew to love it. His intention was to be a full time farmer and to that end he earned a degree in agriculture from Ohio State. (He always talked about having Woody Hayes as a history professor while at Ohio State.) Farming had to be part time though; the cost of raising a family and the inconsistencies of farming income forced him to become a teacher. He ended up really enjoying teaching and did it for 31 years, 9 years at Clearview High School and 22 at Avon High School retiring in 1991. During this time, he kept farming and in the mid 1970’s we began to run the old market which for a few years was run by my grandparents. Lavern and Catherine and was rented out for a few years before that. 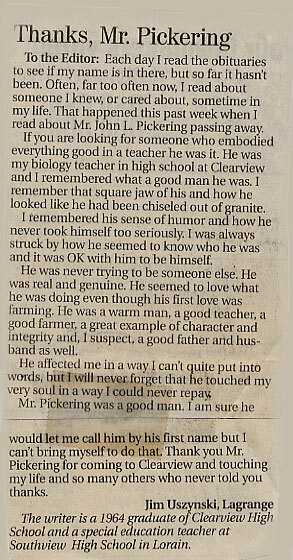 My father loved growing things, but admittedly did not enjoy the selling part as much, that became my niche. He was a humble guy who believed in people, a handshake and a promise were all that should needed. He taught and lived his life that way. 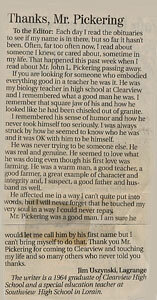 Below are a couple of newspaper clippings about him that summarize him well. Our customers are constantly telling us how good our employees are and we know we have some good ones. From one year to the next some of the names change (as they go off to college or take full time jobs elsewhere), but we have been fortunate over the years to find intelligent, caring workers both in the market and the fields.